Como hemos dicho muchas veces, la perspectiva de que un paciente hemipléjico y sus familiares se enfrentan después de un ataque cerebral, es verdaderamente complicada y contradictoria. The rationality and the good sense, should aim the rehabilitation attention to the brain and its functions, since the hemiparesis is the consequence of a cerebral injury. However, reality has proven that it does not seem to follow the rationality rules, and we have gotten used to see an after stroke rehabilitation made up of active and passive mobilizations, reinforcing the gait, stimulating the standing reflexes (Bobath, Kabat) and botulinum. All of these above mentioned activities do not seem to consider anything beyond the articulations, the muscles, and the reflexes, in other words, the areas damaged by the injury and along thecognitive processes which allow the movement. Cold! it is like when we were kids we hid something in a room and we asked a friend to find it, and we guided him telling him when he got away, “Cold… Cold” while “Hot” meant he was going onthe right direction. It is clear, that each activity only aimed to the muscles, which by the way, are only the visible aspect of the movement, will result in failure, because it gets away from the real problem post stroke, so to the people who propose it, we can then guide them with our “Cold…Cold”. However, with the Transcranial Magnetic Stimulation, things are different and we can finally say “Hot”. In fact, even though we are still far from fully facing the problem, at least this treatment has some assumptions which make us think, that whoever is dealing with the neurocognitive rehabilitation, is getting closer tothe correct path. Hot! Let us see which the assumptions of the Transcranial Magnetic Stimulation are that distinguishes it from other traditional rehabilitation proposals after a stroke. It is aimed at the brain. This is the first detail which makes the Transcranial Magnetic Stimulation (TMS) different than other traditional approaches for the cure of the post stroke results, in fact, it is an important accomplishment to aim the cures and the therapist’s attention to the brain. We have just said that the brain is not usually considered in the post stroke rehabilitation, hence the incorporation of this proposal to the rehabilitation scenery has my complete approval. 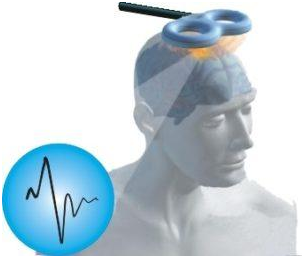 In broad general terms, the Transcranial Magnetic Stimulation consists on the stimulation of the cerebral cells through an electrical energy channel generated by a magnetic field. Not only is the Transcranial Magnetic Stimulation (TMS) aimed at the brain, but rather its final goal is to reactivate the cerebral cells. And by any means, this also represents a step forward with respect to all the proposals that throughout all these years, we have gotten used to hear. i.e. mechanical type proposals that do not even consider a slight involvement of the cerebral functions. What is still missing in order to place the problem under “Hot”. The recovery after a stroke goes through the reactivation of the cognitive processes which were altered by the injury and these could be obtained offering the patient, rehabilitation experiences which stimulate the learning of new motor abilities. This improvement of the learning process has effects on the brain biology, in terms of the cellular activation and new synapses. The Transcranial Magnetic Stimulation (TMS) also has as its objective the same results as the Neurocognitive Rehabilitation, that is to say, to influence the biology of the brain, which is done through a physical procedure, and without the conscious participation of neither the patient nor his learning abilities. “The aim of recovering the gait or walking, and the functions of gripping and manipulating objects using the TMS is the equivalent of aiming to teach a healthy person how to play the piano simply stimulating his brain or the cerebral areas presumably responsible to allow such ability”. This brief and generic personal analysis about the Transcranial Magnetic Stimulation (TMS) has as its goal the analysis of a possible evolution on the rehabilitation post stroke field. On one hand, I see with extreme pleasure, a step ahead if we consider the usual rehabilitation proposals offered; botulinum, orthotics, stretching, robotic rehabilitation among others. Unfortunately, at the end the TMS, turned out to be the umpteenth additional proposal applied to the others above mentioned, thus making the outlook of the rehabilitation post stroke even more confusing for patients and relatives who were faced for the umpteenth time with a proposal loaded with technological innovation which generates new hopes. Unfortunately once again, we try to fly over the problem, rather than go right through it or finding short cuts for the recovery post stroke, but the reality of the recovery is based on the demanding work of the Neurocognitive Rehabilitation which really faces the real problem of the stroke, that is to say the alteration of the cerebral functions that allow the movement. Keep up to date on events and news. I suggest you to add your name and email address in the box down below and start by reading the free article “Ten things you should know about a stroke”.